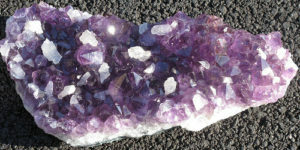 Crystals have been utilized for thousands of years for guidance and inspiration. They have been incorporated in divination (the practice of using signs) to offer guidance and the answers they offer can be interpreted in various ways. As yoga is not an exclusively exercise, but rather a practice that unites the consciousness with the essence of the Universe, several healing crystals can be incorporated in your yoga practice to enhance your practice. Crystals help to balance and align your chakras, as well as remove any blockage in your chakras that are obstructing the free flow of energy. The combination of crystals and yoga is powerful. Rose quartz: The stone of self-love and compassion for others, this stone is credited with helping us in becoming more accepting of others and also with possibly assisting us in healing past emotional wounds. The rose quartz would be wonderful for a yoga practice where a large focus is put on poses that open the heart. Amethyst: This purple stone represents peace, stability, patience and inner strength and would compliment a practice focused on restoration. Citrine: The warm yellow stone is associated with abundance, prosperity, and success. The stunning color of this stone is believed to inspire positive thinking and would be a great addition for a power yoga practice. Hematite: This is a heavy stone that induces a feeling of spiritual grounding and a sense of protection. The hematite stone could be great for a restorative yoga practice. Flourite: This stone is associated with helping to improve the ability to concentrate and calming any restlessness that may be presenting itself as an obstacle to one’s ability to focus. Clear quartz: The clear quartz stone helps to invoke clarity of mind, inner strength, and spiritual growth. This stone is believed to assist in the release of spiritual and emotional pain in order to achieve clarity, inner strength and spiritual growth. You can decorate the space where you practice yoga with whatever stones you are attracted to and keep their meaning in mind when meditating and setting your intention(s) for your yoga practice. You can also place them directly surrounding your yoga mat, but first make sure you cleanse them and set the highest intentions for their purpose within your practice.